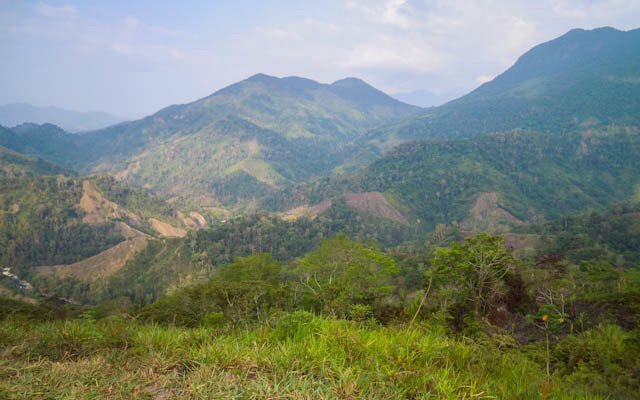 » Ciudad Perdida Tour – Are You Up To It? 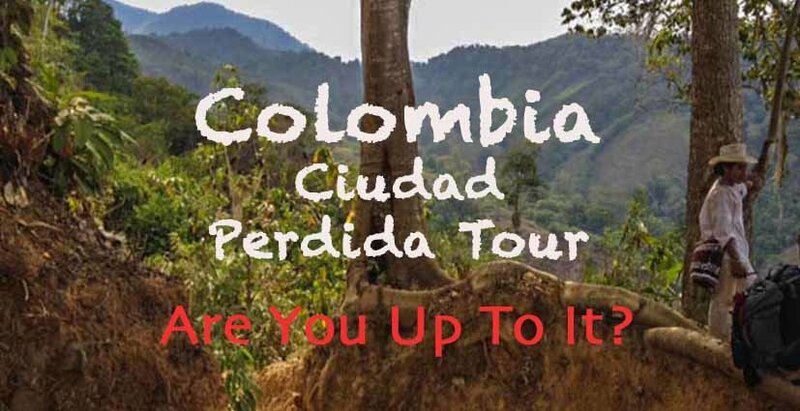 Ciudad Perdida Tour – Are You Up To It? 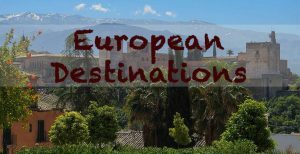 Sweat dripped into my eyes and my sunglasses slipped from my nose constantly as I set one foot after the other to climb a steep, dusty path up into the mountain range of the Sierra Nevada. 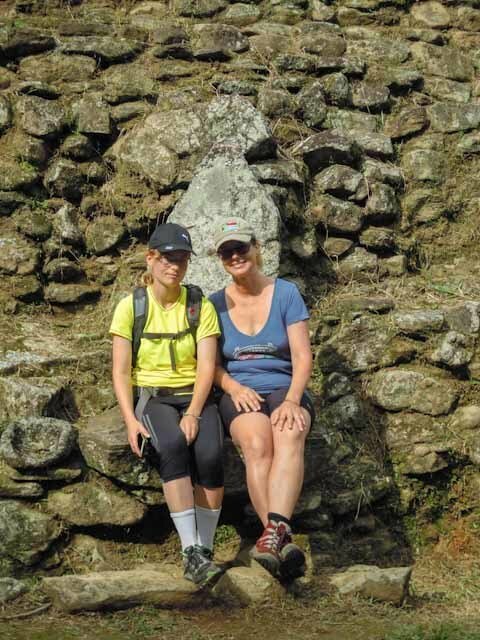 After some doubt, my daughter, Naomi, had convinced me to join her on the six-day Ciudad Perdida Tour (Lost City Tour), a 46.6-kilometer hike in Colombia. 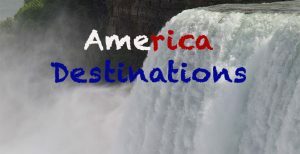 Book this tour with G Adventure! The amount of altitude difference covered during the trek is quite a lot and the heat takes its toll. Hidden in the middle of the jungle it’s supposed to be a must-see for tourists, as it was built six hundred and fifty years before Machu Pichu. My daughter, Naomi, learned Spanish in Venezuela for a year and loves South America. 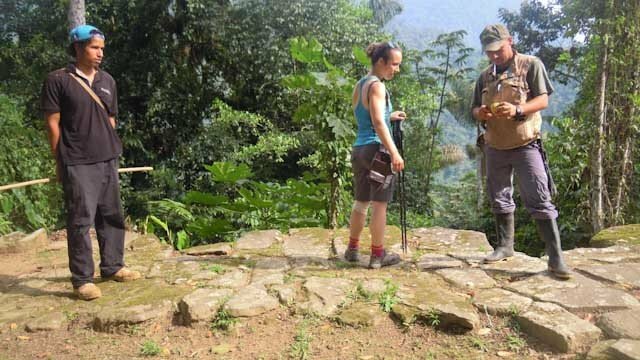 She convinced me to participate in the Ciudad Perdida Colombia Trek, although several blogs on the internet mentioned, the Ciudad Perdida Tour to be only for people, who are in good shape and sporty. I like to eat well and to chill with a pile of books, which results in a body to be not very well tuned for athletic activities. But nevertheless, I wanted to take the challenge so as not to be a wet blanket. We met the other group members at Santa Marta at the office of the tour operator. Three young Israeli guys, who had just finished their military service and were full of testosterone and power. They were ready to take over any challenge, which would come their way. A young Canadian couple, the scientists Brad and Stephanie, seemed to be ready for hiking too, whatever awaited them. Only a lady from England, Jacky, looked like she might be not too sporty either. 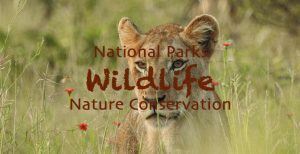 My only wish was not to be the tail-light of the group, as Naomi for sure would join the youngsters without difficulty. My hope sank when Jacky told us about her hike to Machu Pichu in Peru. In the comfort of the air-conditioned office, I started to doubt my irreversible decision to go on the adventure Santa Marta La Ciudad Perdida. We packed ourselves into a tourist jeep without an air conditioner, which had seen better times. The guide, Jhon (Spanish spelling for John), a happy fellow with braces, managed somehow to tie all our backpacks onto the roof. Braces seem to be a fashion symbol in Colombia. Young adults wear them, as soon as they can afford to. The driver, a bad humored Colombian of a squat stature, honked his way through the crowded streets of the city. People on bicycles and donkey-cars miraculously managed to escape being knocked over by our vehicle. Once out of town, the streets were less crowded, which didn’t improve the driver’s driving skills or to obey any road rules. Only at a few police stops did he slow down. He obviously knew by heart, where the police blocks were. As soon as he’d passed, the motor howled angrily as the driver forced the accelerator down to the floor. I kept an eye on a monstrous truck behind us, whose huge hood was only a few meters behind our car. There was no escape if the truck would smash into the back of our Jeep. Relief overwhelmed me when we turned off onto a dirt road after about two hours of mad driving. Our driver took the curves and the precarious dirt road with maddened speed. Our heads popped around like dummies and bumped painfully into the car body of the Jeep. Mat, the Canadian, soon felt sick. We were relieved when we arrived at the starting point of our trek in the small village of Macheté. Heading off with our backpacks and hiking shoes, the heat was already bearing down on us. Starting with a decent path meandering through some innocent hills, I was feeling good. Even more so as we arrived at a deep freshwater pool at a river, where we took an invigorating swim. The ones who dared could jump from the high boulders into the clear waters. Some small fish nibbled on our skin, but nothing to be scared of. Much too soon we had to proceed. The first steep uphill challenged us in the hot mid-afternoon sun. 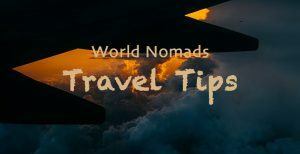 If you consider the Ciudad Perdida Colombia Trek or another trek like the one to Machu Picchu Peru, check out this very useful Packing List. Every time I hoped that the steep path had reached the top, another corner opened up a deep-sandy uphill trail. The air was sizzling. At times a soft breeze of warm air touched my heated skin when high walls of soil on either side of the path were discontinued for a few meters. Mules passed on their thin but sturdy legs, carrying heavy bags full of supplies. They left us covered in a thick red dust. No cars have access to this remote mountain region. The dust whirled up by the hooves of the mules, blocked my nose and breathing got hard. I had read about the first day is the hardest. The altitude to overcome is several hundred meters, meaning a couple of hours of hiking uphill. Finally, I reached the highest point, where the rest of the group waited for me and enjoyed some fresh fruit. In the late afternoon, we finally arrived at the camp. Novelty for Naomi and me: we had to sleep in a hammock. 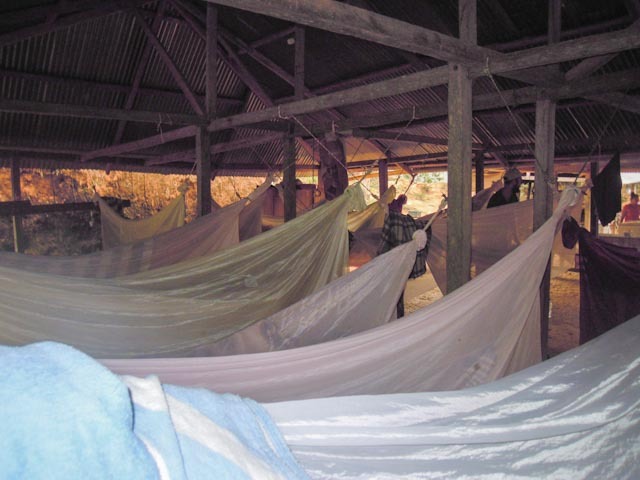 Ours hung between fifty other hammocks, leaving barely any privacy other than a mosquito-net to pull over our hammocks. From the three simple privies for all hikers, just one was functional as the other two were blocked by debris. Some tourists find it hard to retrain to put toilet paper in a waste basket next to the toilet thereby avoid blocking of the plumbing system. It’s a given in many of the South American countries. The number of people sleeping-over reached about fifty which made for some for a long wait in their sweaty clothes in front of three intensely used showers. I was by far the oldest in the whole camp. Most probably I was just particular and the youngsters didn’t have any objections to the basic accommodation. I decided to thrash it out and to accept my hammock without prejudice. But despite my tiredness, I wasn’t able to get a good sleep. An orchestra of snoring kept me awake during the night when a deep, recovering rest was essential for my tired body. The second day of our Trek Ciudad Perdida started late in the morning. I wasn’t able to imagine four more days like the previous one. As dreaded, I walked far behind the group almost all the time. The youngsters rushed over the hills and through valleys, challenging each other at a faster pace. The translator of the group, Miguel, propelled me. I felt like a mule. Increasingly irritated, I asked him to leave me alone to walk at my own pace. Just said, a red-white-black colored snake crossed the path in front of my feet, a coral snake, one of the most poisonous snakes of South America. I felt embarrassed. My clothes hung limply from my body dripping with sweat. I feel sorry for myself while nobody else seemed to struggle the same as I did. Now and again Jhon stopped, so I was able to catch up. Inevitably the slowest of the group never gets to rest. On the top of a conquered mountain, he paused occasionally to provide some fruit or to exchange useful knowledge about the surroundings. Once, he was able to catch an armadillo, an animal like an ant-eater. I missed it, unfortunately. We passed vast farmlands, which in earlier days, held plantations of cocaine. 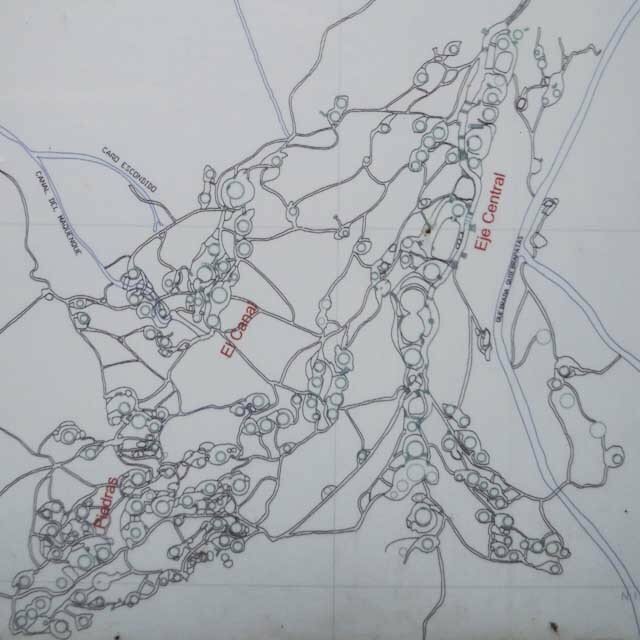 Various groups violated the region to get power over drug distribution. To fight illegal cultivation, the government ordered the poisoning by airplanes spraying the fields. The population suffered illnesses and deaths in consequence as the soil became contaminated. 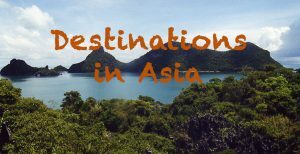 Now cows are grazing peacefully, sugar cane and other legal crops are growing and tourism has become the main source of income for the locals. 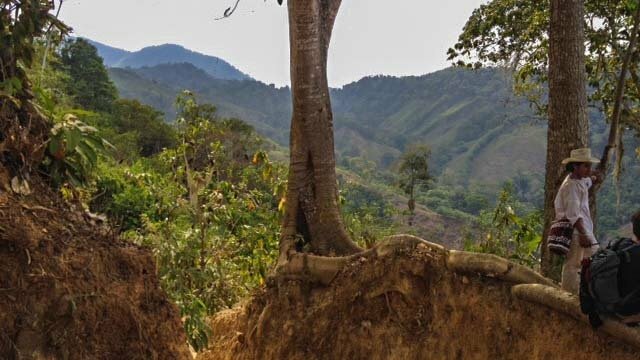 Only the indigenous descendants of the Tayrona tribe are still allowed to grow cocaine for their own use, as they use it for spiritual reasons as they have done for generations. Another night in a hammock as the few available beds in the next crowded camp was already overbooked. 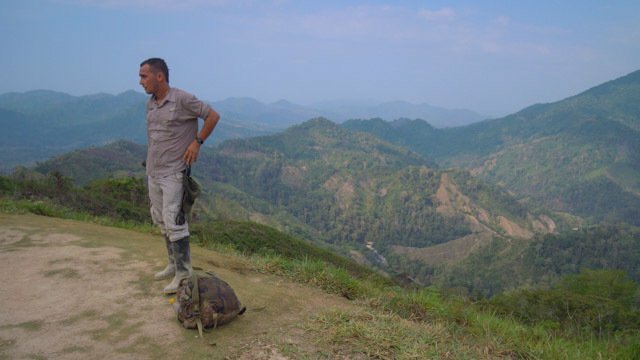 Trekking Ciudad Perdida means to take as little clothes with as possible. Most hikers try to wash the sweat and dust out of their clothes every day so that they can wear them the next day again. The huts near to the river offered a good opportunity to do so and to take a swim in the cool water. Clothes hung in every available place to dry. After a few hours of sleep in a most uncomfortable position, we left for another tiring hiking day. I was stiff and my joints felt like they needed some grease to work properly. The path led downhill most of the time. My spirits lifted as a jealous child when I overtook Stephanie, who was struggling with a sore knee. I accelerated excited not to be last for once. Pride comes before the fall. I soon fell back to my old position as tail-light as we turned uphill. We passed an original village, where shamans of neighboring tribes had a meeting. Shamans are the political and spiritual leaders of the communities. They wear a distinctive white hat, which symbolizes their wisdom and carries a poporo, which is a dried hollow fruit like a pumpkin, where they put pulverized seashells in. The men take the powder with a stick out of the bowl to mix it with their saliva. Then they skim it off at the neck of the poporo, which grows thick by the moisture from the saliva. The neck of the poporo gets more voluminous the longer it is in use. It symbolizes the thoughts and wisdom kept within. 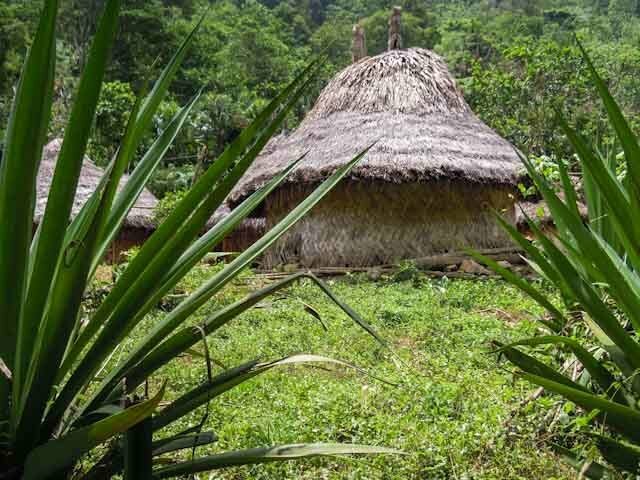 The indigenous people live in very basic mud huts covered by material from the surrounding forest. The children were urged to go to school in the 1980`s. The project stopped as there was a rebellion from the tribes against the religious teachings, which was taught to their children at school. They were not against the education itself but didn’t want that their children were preached about Catholicism. The tribes opposed being urged to forget their own beliefs of their ancestors. Now the children get only taught about the traditions within their tribe, as far away from modern education as it can be. Nevertheless, there will be or already are changes. 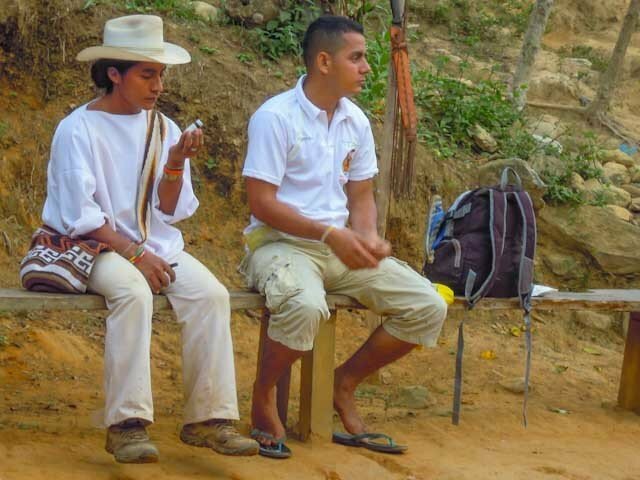 The contact with tourists along the Ciudad Perdida Tour changes their culture. Stupefied I noticed, for example, a huge golden watch on an arm of an indigenous man and also a guide of the wiwa–tribe with a satellite phone. I was wondering if he would retire to his mud hut without water and electricity in the evening. Surprisingly the indigenous people are able to reach an age of more than a hundred years. Often though, men get older than women. They carry the risk of having to give birth to more than half a dozen children. As a woman aged half a century I take it as highly unfair, that women of the wiwa-tribe aren’t allowed to have any sexual activities after having reached menopause. They get substituted by a young woman to add more children to the household. Together they care for the growing family. We were to reach the camp before the last steep uphill to Ciudad Perdida within a tiring 4 1/2 hours. The guide asked us during the break if we’d like to add the hike up to the Lost City and back of an additional estimated four hours on the same day. It would have the advantage to see the ruins of the Lost City during the afternoon without crowds of other people. Most groups arrive in the morning after having slept at the last camp. The group decided they wanted to go for it this very day. For me, it hadn’t been about voting yes or no. I just knew I wouldn’t make it, let alone enjoy the arrival at the Lost City after a six hours hike with another two hours to return to the camp. My daughter. Naomi wasn’t feeling well and was suffering from stomach cramps, which unfortunately made the rest of the trek increasingly unpleasurable for her. I’ve never been so grateful for a thunderstorm which didn’t allow us to hike to Ciudad Perdida on the same day. The last camp before the Lost City was worse than any of the others before. There were beds with flimsy foam matrasses. The space between the beds was nonexistent. Although it was only midday, most people were too tired to notice their lack of privacy and had a snooze. Neither I nor Naomi was feeling excited to reach Ciudad Perdida anymore. The morning of the fourth day of our Trek Ciudad Perdida we climbed over mossy paths along the river. All was slippery and wet from the rain of the thunderstorm from the previous day. 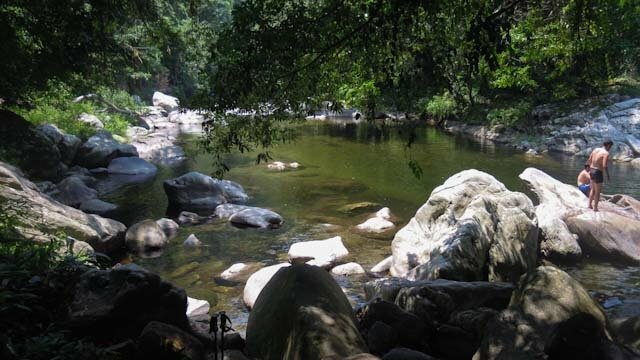 The Buritaca river twists and thrashes over the rocks all along the valley. During the whole Ciudad Perdida Tour, we had had to cross this river about twenty times. I didn’t bother anymore and walked through the water with my boots on. 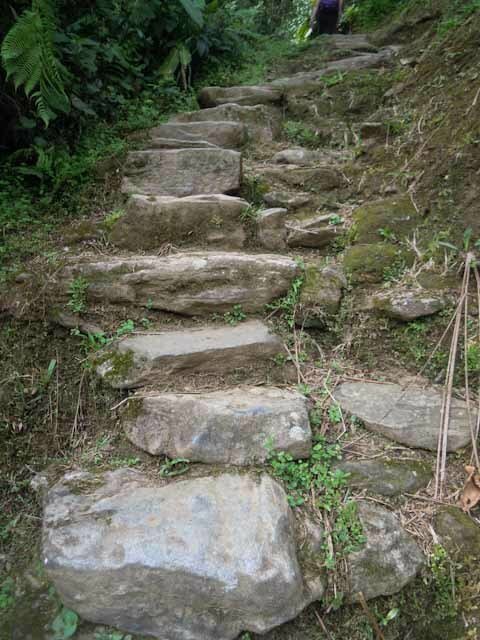 After about an hour of rocky terrain and crossing the river one more time, our spirits lifted, when we reached the legendary original stairs, thousand and two hundred steps up to the Lost City. We started to climb, trying to get a grip on the ancient rocks, whose surface is smoothed by the thousands of feet over the centuries. 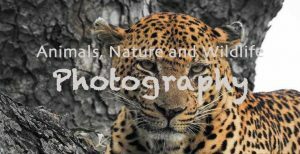 I wondered if there were any casualties among the tourists slipping and breaking their bones in the middle of the jungle over the last few years. 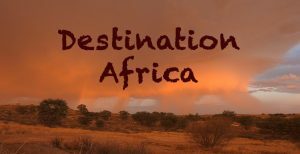 Would the tour operator get you out by mule or fly you out by helicopter? I tried to distract my troubled thoughts by counting the steps I had negotiated so far. Finally, the Lost City, we’d made it. Nature around the first ruins looked like it started to swallow the precious remnants of the past. Thousands of mosquitoes prosper in the humid, hot climate and swarmed out to get some fresh human blood, while we tried to concentrate on our guide’s remarks. 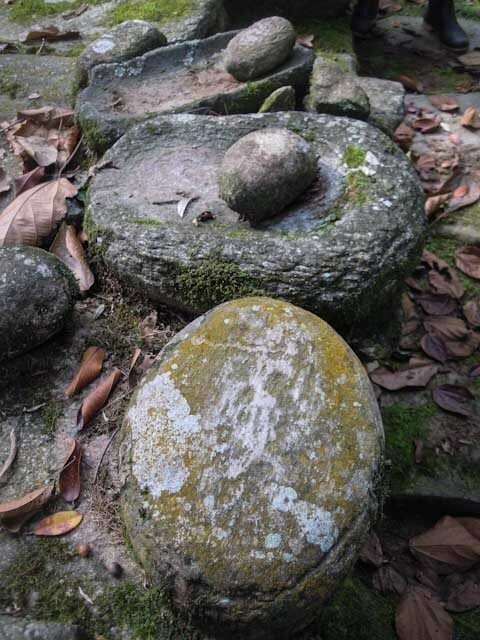 The stony round ruins of the building, where the Tayrona people lived, worked and held their spiritual meetings were clearly visible. 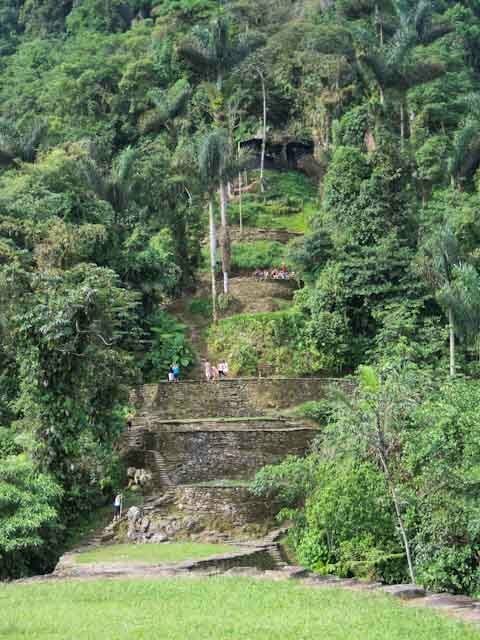 It’s thought that between four and ten thousand people lived in Ciudad Perdida and that the city encompassed over twelve thousand square meters (129,167 square feet). Teyuna, the old name of the Lost City, sits on a thousand three hundred meter (4,265 feet) high ridge. When the Spanish conquistadors invaded Colombian shores and brought severe illnesses like smallpox and syphilis with them, Teyuna was abandoned. The jungle reclaimed its rocks and pathways so that for three hundred and fifty years the city lay hidden from the world. 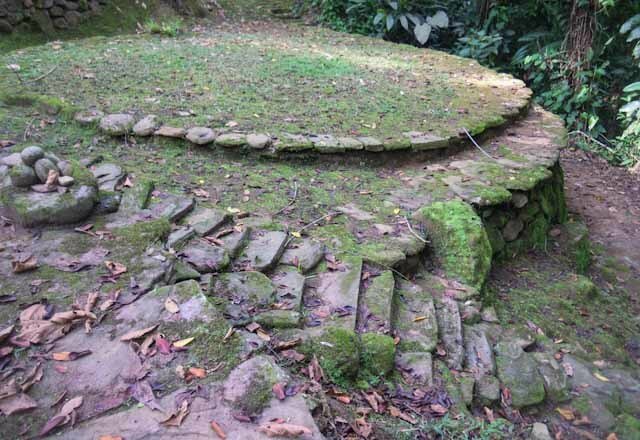 Then in 1972, tomb raiders stumbled upon the stairs next to the Buritaca river. A couple of years later the government restored and opened the site to the public. 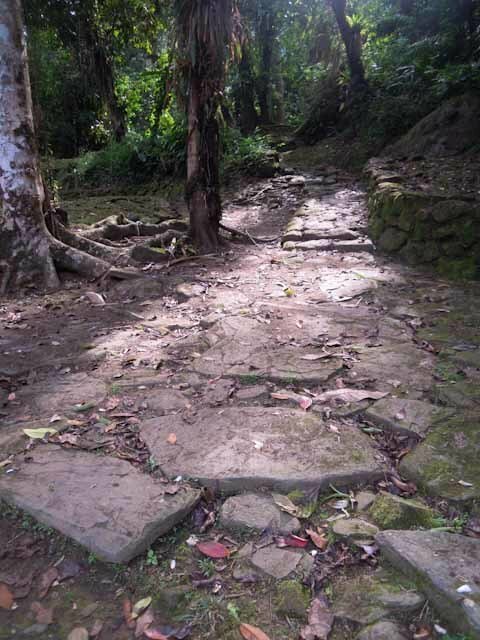 The site is divided into several sections with a total of 169 stone terraces, that make up Ciudad Perdida in its current form. Three thousand square meters of the site are open to exploring. A winding staircase leads from the marketplace on to the ceremonial platform, which was not open to the common inhabitants. Deep in the jungle, another nine thousand square meters (96,875 square feet) of the structures are still hidden in the forest. 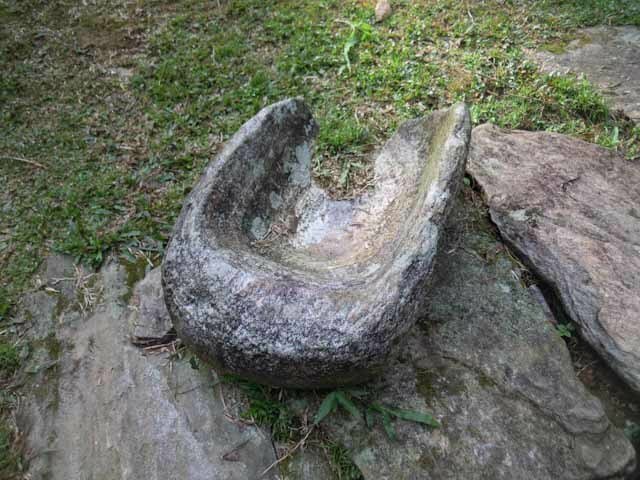 Once, maybe even more of this ancient civilization can be brought to light if the woods don’t claim the place back first. 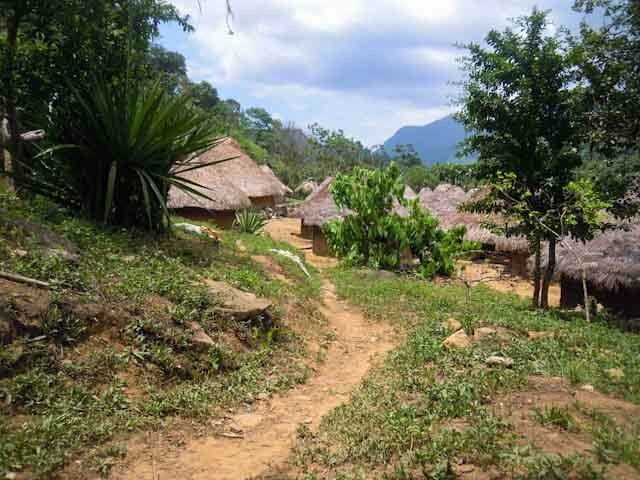 Today the Lost City is a holy place for the indigenous tribes, who are descendants of the Tayrona people. They have a festival of two weeks each year, where they don’t allow other people any access to. We spent only about an hour to explore the Lost City. That sounds like an outrageous short time after such an effort to get there. But we didn’t really need more time as the visible ruins are not that many. After getting some rest and a snack we continued our Colombia Ciudad Perdida Trek carefully down the precarious wet thousand two hundred steps to the river and back to the camp, only to have lunch and shoulder our backpacks to proceed for another four hours. Unfortunately, it started to pour with rain in another heavy thunderstorm. The paths turned into dirt rivers. 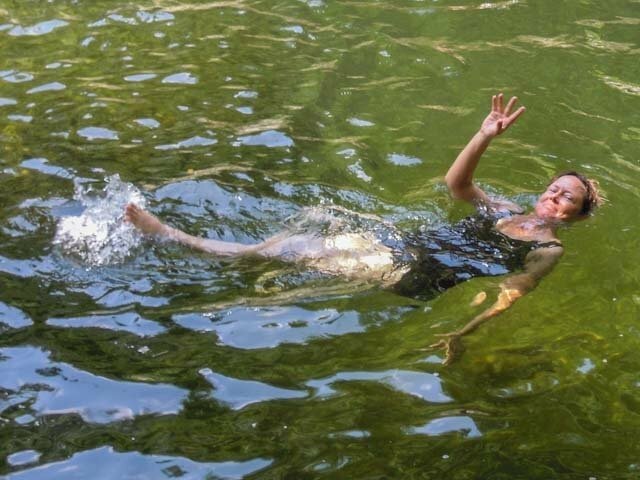 I found out that, when I walked into the stream, I slipped less. Skis rather than hiking boots would have been adequate to descend and spikes to ascend in the mud. Jhon helped out where he could. On an open exposed meadow, where we had admired two houses of the shamans and some cows on the previous day, lightning strikes were close by. Everybody struggled to get over the soggy grounds, soaked wet to the bones. Our guide chopped a snake in half with his machete which was dangerously close to our path. Maybe it was the same one I’d seen on the day before. We didn’t care, we just ran. Only the last hour before arriving at our camp for the day did the rain stop. 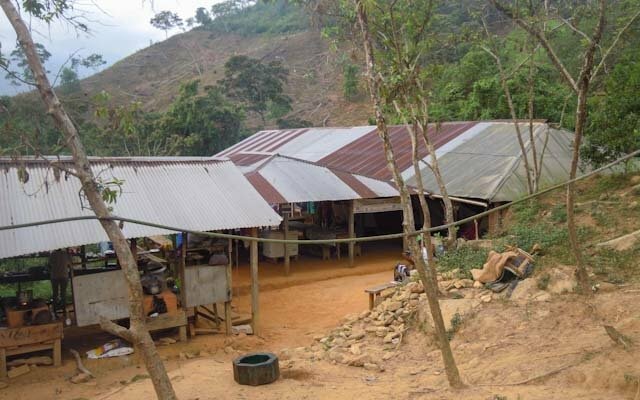 We spent our night in the same camp as on the second night of the Ciudad Perdida Tour. 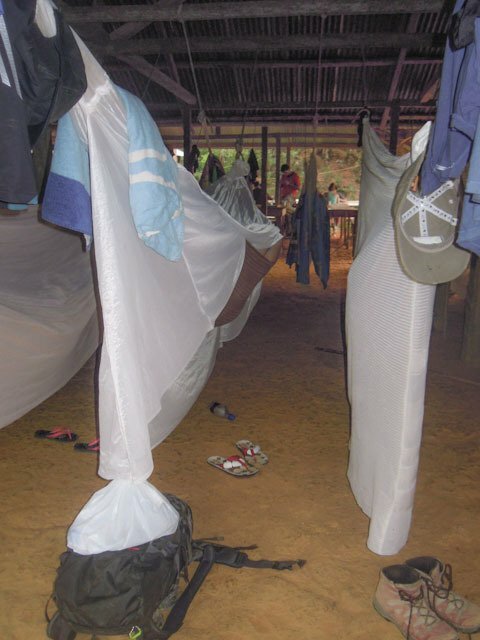 This time because of our early arrival, some beds were available and we could give the hammocks a skip. Some of our group had some serious gippo guts. The distance to the toilets was a lifesaver. Despite the fact that Naomi and I were dead tired after more than an eight hours hike in nasty conditions the previous day, we decided to try to end the hike in a total of five days with the other group members instead of six. We couldn’t wait to get back to civilization as the lack of privacy got at us. One more six hours hike to complete. The morning started crabby as Miguel, the translator, took off to walk with the rest of the group members without announcing his departure. Naomi fought with an upset stomach but nevertheless tried to keep up with the group. Jhon’s knee was hurting. Even he seemed to take it slower. I was contemplating during the tiresome hike in the heat of the day, what on earth had made me take this trek to Ciudad Perdida. I figured that I detest carrying all my stuff in a backpack, especially in the heat, with mosquitoes, snakes and other creepy crawlies around. 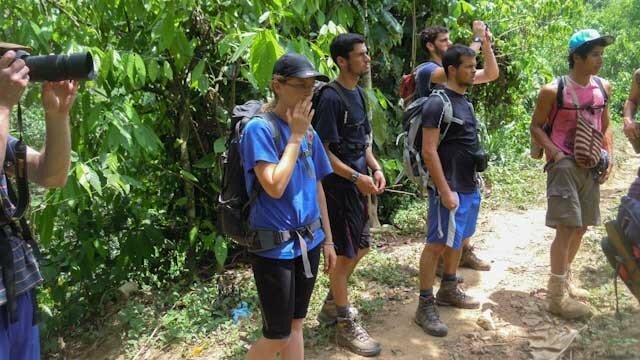 The later the day, I started also to dislike all hikers, who came across, negotiating the first or second day of their hike to the Lost City without much signs of fatigue. Hours passed by and I didn’t see any of my group members nor our guide. Hoping that I wouldn’t get lost, I continued walking, becoming increasingly demoralized. The steep uphill brought me to despair. The one which made me happy when I overtook Stephanie on the third day of our hike in the other direction, A mule passed with its guide who nearly pushed me off the path. Mules don’t have any conscious of going around obstacles like living human beings! They rather just plow straight ahead. The sweat burned in my eyes and I felt exhausted. After a short straight path, I passed another camp full of backpackers, who enjoyed the few hours before sunset on the terrace. I disliked them too, sitting there with a cool drink enjoying themselves. Shortly after the camp another steep uphill, the start of more tiresome, endless kilometers. One foot more and one foot more, step by step. A young park ranger with his mule and a saddled empty mule passed and noticed my desperation. He offered me a lift! His mule carried me all the way up to the top and even a little further. My spirits were back. None of my buddies to be seen, though. Finally, I recognize the steep dusty path from the first day of the Ciudad Perdida Tour, which was only a few hours from the starting point of the hike. Lightheaded I walked down, having a rest now and again only to watch the stunning view over the green mountains as far as my eyes could see. I passed a couple, where she obviously struggled to go downhill, as she had injured her feet on a slippery stone in a river bed. Shortly after I caught up with Brad and Stephanie. She struggled again with her knee and only managed a slow pace downhill. Arriving at the river with the pool I realized that I had been much slower than the others. But I was grateful, that the Ciudad Perdida Trek didn’t leave me with any injuries or illness. I dove into the water and enjoyed the cooling down feeling. Only one more hour and I would have achieved the end of the hike! I was proud of myself. Naomi, however, wasn’t feeling well. She’d been struggling with a bad stomach all along. We reached the restaurant with lunch waiting for us an hour later. We’d made it! The drive back over the dirt road was even worse than on the way up, but we didn’t care. After fetching our luggage at the office in Santa Marta we thanked Jhon for being such a patient, well-humored guide. We returned one day early to our hostel. No air-conditioning, no private room available, only two beds in a dorm. What the heck! After what we had endured in the last days it was a breeze to sleep in a dorm. We celebrated our return to civilization with a glass of ice water, not to upset any stomachs any further. Good to be back! Prepare well for your Long Haul Flight to Colombia. Visit Cartagena and spend some leisure days in Santa Marta before your Trek to Ciudad Perdida. Here you find a guide on how you get from Cartagena to Santa Marta.